A well-known star cluster that glitters with the light of millions of stars may have a mysterious dark object tugging at its core, according to researchers at The University of Texas at Austin. Astronomer Karl Gebhart has teamed up with recent Ph.D. graduate Eva Noyola to find evidence for a medium-size black hole at the core of Omega Centauri, one of the largest and most massive globular star clusters orbiting the Milky Way galaxy. The finding will appear in the April 10 issue of The Astrophysical Journal. 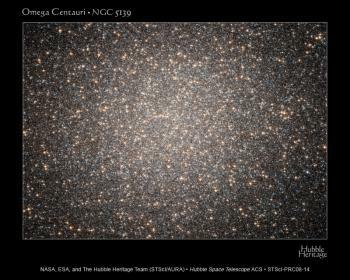 The globular cluster Omega Centauri, viewed by Hubble Space Telescope.